Next week I start running the after school gardening club where I teach in Dubai. I'm a keen gardener, but it's all hit and miss. I've successfully grown tomatoes, chillies, herbs, strawberries and peppers, as well as marigolds, petunias, nasturtiums and sweet peas. I've never followed a schedule, just kept an eye on the municipality planting schedule and visited their nurseries out in Warsan last week. I've a few ideas for the sessions, but at this moment I have no idea of the numbers, the ages, the length of sessions and how long the club will run for, other than assuming till the end of term in December. I've been told I have a budget, but not how much and of course with no idea of the number of children and duration. I can do all the planning and have a few ideas ready to run for the 1st week, until I know numbers, ages etc, but what I need is an order of planting. It's autumn in Dubai, but temps still in the high 30's and NO rain, so I can't follow a European planting scheme and the seed packets in the garden centre are imported so most, if not all seeds have to be germinated indoors until 30c and planting out isn't always that easy. No one will be around to water over the weekends and I'm not hopeful the other children will not mess with the plants at playtime. So I'm thinking indoor plants, container vegetables and succulents with a bit of art and creativity thrown in. 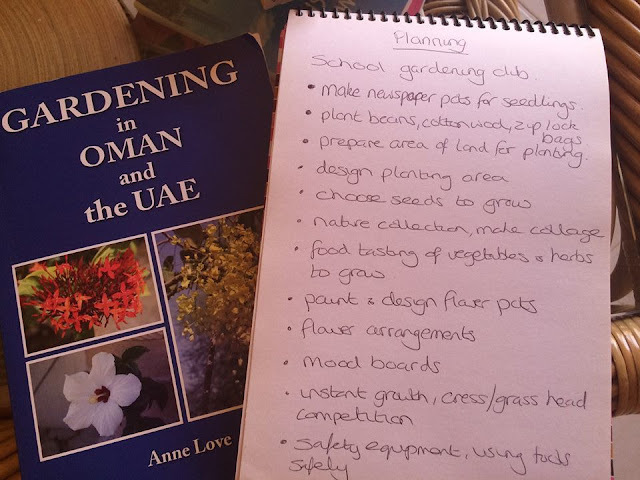 If you run a gardening club in your school, particularly in Dubai, I'd love to hear from you to share some of your tips and ideas. Look forward to see how you get on - good luck! I used to run gardening clubs in the UK but I would have no idea what to grow in Dubai. I have a few ideas you might be able to use on my blog under "NATURE ACTIVITIES" though.